These safety guidelines apply rain or shine. The safety of our children comes before convenience. Please make sure grandparents, sitters, and friends are aware of these guidelines. It is illegal for drivers to use cell phones in the School Zone. Children may only exit the vehicle curbside. Do NOT drop off children in NO Stopping zones. Children should walk bikes on school property. Pull forward to the double line and let your children out once all the cars come to a stop. No unattended cars are allowed in the carpool lane from 7am-9am and 2pm-4pm. Have your children ready once in line. Students may not be let out on Glenwood Drive. When pulling up to the afternoon carpool line, please park directly behind the car already in line. Do not leave gaps between cars. NEVER drop your children off in the teacher’s parking lot. SLOW DOWN through the designated school zones around campus. The speed limit in the zones is 20 MPH. Please observe the “No Parking” signs around the crosswalk. Do not park in front of those signs for the safety of the people using the crosswalk. The bus lane is off limits for parking at all times. Failure to observe this could result in a parking ticket from the city. After school, students may cross the street and meet an adult at the park only if the proper paperwork has been filed with the teacher. Parents and students may cross only at the crosswalks. Please follow the directions of the crossing guard when one is present. Do not let children ride a bike through the crosswalk. They need to walk the bike across the street and park it at the bike rack. Parking in the alley behind the houses or using the driveways of the houses around campus is not allowed. On Overton Park Drive East and Overton Park Drive West, please park at least 20 feet from the intersections to allow the school buses to make the turns. 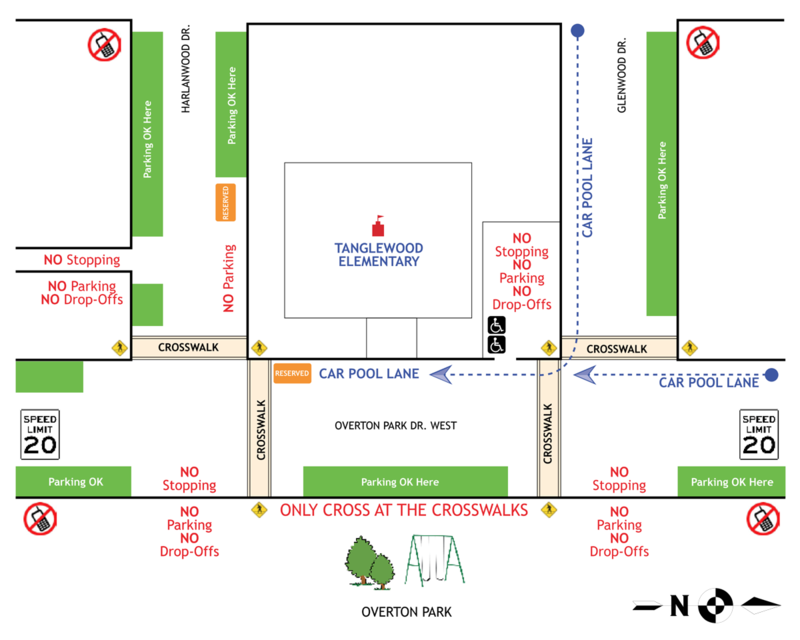 The first space of the carpool lane on Overton Park West is reserved. It is marked off by blue and yellow paint. Please do not park in this space at any time. The space in front of the handicapped area on Harlanwood is also reserved. Please do not park in this space. All students will be dismissed from their homerooms with the exception of classes located in portables, they will be in the auditorium. Please wait in the front foyer until all students are in place. We will begin calling names from the carpool line at that time. Mr. Williams and other assisting administrators will be on duty in the carpool line. They will ask for your child’s name and the teacher’s name. Please do not ask for an early dismissal during this process. We need to focus our attention on transitioning students and getting parents to the classrooms. Questions, suggestions or comments regarding safety are always welcomed. Please contact Principal Smith.